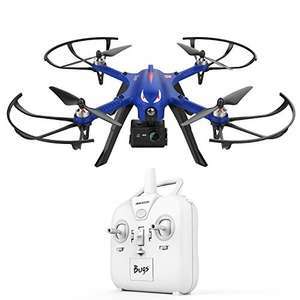 Monster Blue Bugs 3 High-Speed MJX Quadcopter Drone with Flying Time Supports GoPro HD Camera £69.99 + Free Delivery in the UK @ Sold by ST. Direct EU and Fulfilled by Amazon. Monster Blue Bugs 3 High-Speed MJX Quadcopter Drone. Offer price: £70+ Free Delivery in the UK. Enter code: F9T5XXM7 at checkout. (Code is visible at listing). Hot, I paid over £100 for this and it’s a decent piece of kit, bought 2 extra batteries too. Although it’s not that feature packed, no follow me home etc, and when it says it supports a GoPro camera, it means it lifts a GoPro, you can’t remotely take pictures etc with it. Doesn't look like a stabilising gimbal on this. It looks fixed. Video will likely be as shaky as anything when moving or in windy conditions but if in low or no winds might not be too bad. Whoops accidentally voted cold! This is a good deal. I ordered on the last deal of this. Looks decent, a lot bigger than the one I bought by son last Christmas. feels solid, and definitely looks the part. However, and this is one for anyone who owns this that may be able to help, mine came, and I built it. But when turning controller on then plugging in the drone, the front light comes on, but the underneath do not. And it will not connect to the controller. So can't get any motors working, just nothing happens at all. I ordered on the last deal of this.Looks decent, a lot bigger than the one …I ordered on the last deal of this.Looks decent, a lot bigger than the one I bought by son last Christmas. feels solid, and definitely looks the part.However, and this is one for anyone who owns this that may be able to help, mine came, and I built it. But when turning controller on then plugging in the drone, the front light comes on, but the underneath do not. And it will not connect to the controller. So can't get any motors working, just nothing happens at all. Just tried mine. Wouldn't work at first but eventually found that pulling down the left stick and pressing the red button got it going.